The first step is to locate the access panel where the cartridges are located. 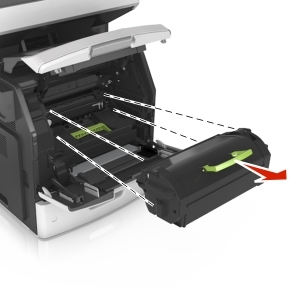 For most laser printers, this panel will be on the front or the side of the machine, but the access panel may also be located on the top for smaller printers. When you open the panel, you should see the cartridge or cartridges. If it is a monochrome laser printer, there will generally be only one cartridge, while a color laser printer will usually include four cartridges. A lot of toner cartridges are being made with handles these days, making them easier to pull out of the printer when empty. Once you remove a seemingly empty cartridge, though, be sure to put something under it like a sheet of newspaper, as spilling is always a small possibility, and you don’t want toner powder on your desk or table. The new cartridge will usually come in a sealed bag inside a box. Remove the bag from the box, and carefully open the bag, unless you see that toner has already leaked excessively inside the bag. If this is the case, the product is defective and you should return it to the vendor. Remove any tape or shipping seals before installation of the new cartridge. Remove the new cartridge from the bag and gently shake it from side to side so the toner is evenly distributed. There will likely be a shipping seal or tape that needs to be removed before installation. Just pull the tab and it should easily come out. Hold the handle and slide the cartridge into the allotted slot, and be sure it locks into place. If you are replacing color cartridges, make sure you are inserting the correct color into the correct slot. Close the access panel and print a test page. If the cartridge is not being recognized, it is possible that the printer memory is stuck and will only recognize the previous cartridge. In this case, remove the new cartridge, turn off the printer and unplug it for about 10 minutes. Plug it back in, turn it on and install the cartridge again. This process is called a ‘cold start’ and should reset the memory. While these are only basic instructions, they should be enough to get you started if you have never replaced cartridges before. For the best results, you should consult the manual for your printer or the manufacturer’s website for more specific instructions for your exact model.